Home > Knowledge Center > What Color Should Your Front Door Be? Since a home’s front door is the first thing that most people see, it can have a big impact on curb appeal. Choosing the perfect front door color can be complicated because there is quite a bit to keep in mind. We’ll guide you through all of the things you may want to take into consideration while complimenting the existing style of your home, because it isn’t as simple of picking a color that you like. A color wheel helps identify which colors pair nicely together and is a must-have for anyone about to embark on interior or exterior color selection. It’s divided into primary colors (red, yellow and blue), secondary colors (orange, green, purple) and tertiary colors (Yellow-orange, red-orange, red-purple, blue-purple, blue-green & yellow-green) which are formed by mixing a primary color with a secondary color. These days, you can inexpensively buy a more sophisticated color wheel that will take most of the guesswork out of how to use it, such as the one in this helpful video below. Watch to learn how to use it. A summary of the basic information a color wheel can tell you includes the following. Complimentary schemes: Using two colors that are directly across from each other on the color wheel adds dramatic energy to the space. 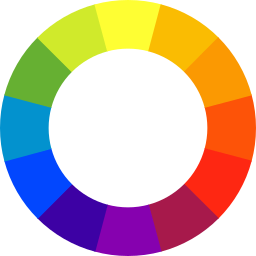 Contrasting color schemes: If contrast is what you’re angling for, use colors that are evenly space on the wheel. This could be purple, green and orange, for example. Analogous schemes: This involves using three colors right next to each other on the wheel. Because they match so well, they create a serene environment. And, there are many other schemes. The color wheel is a powerful tool. Take note of your home’s exterior. Do you have green in your shutters? What color is the exterior paint? If the latter two colors aren’t changeable, use the wheel to determine a front door color that fits the look and feel that you are trying to achieve. For example, a pastel front door probably isn’t going to look right on a Spanish-style home with an orange tiled roof. Browns, reds and perhaps turquoise? 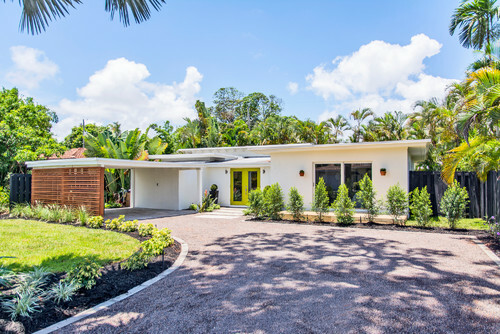 These probably would work.A yellow/lime green on a mid-century modern home above? You decide. Ultimately, it’s your front door but many experts believe it should be a powerful, bold color that is not repeated anywhere else on the house. The front door is the most powerful focal point on the home and can pull together other colors features on the exterior if done properly. 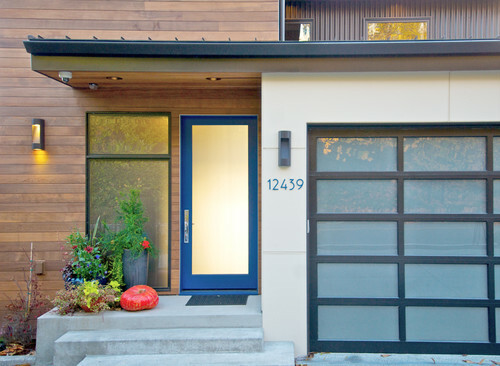 Blue: One of the most popular front door choices, blue conveys a feeling of tranquility and that the homeowner views the home as a sanctuary from the hustle and bustle of daily life. It looks amazing on the home above, tied in with the planters. Brown: As the color of earth and many organic things, brown is associated with things that are natural. 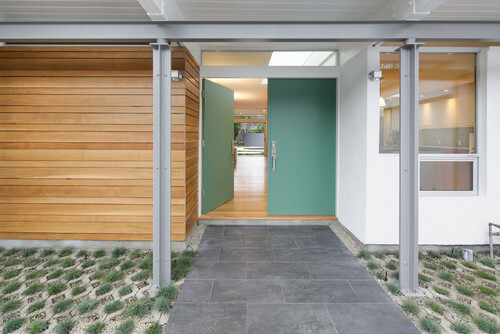 A front door this color can mean that the homeowners would like to blend in. Red: This color is a stimulant and an attention-grabber. It conveys that the people inside the home are likely vibrant and fun to be around. Red is also the color of prosperity in Asia, which is an automatic reason why some families paint their door red without any consideration for color schemes. If you feel that red might put your door too much in the spotlight, deepen the shade. An alternative is to determine the look of your front door solely based on feng shui where the front door is incredibly important because it directs the flow of chi or energy into the home. A front door with good feng shui will allow the maximum amount of good chi into the home. Then, you can use the color wheel to make sure the exterior colors mesh with the front door color of choice or to choose a shade of front door color to match what is currently happening. You’ll need a compass first to determine exactly which of the eight possible directions (north, northwest, west, southwest, south, southeast, east, northeast) your front door faces. Tips: iPhone users probably have a compass app already loaded. If not, plenty of free ones are available. Here is an example of how this works. 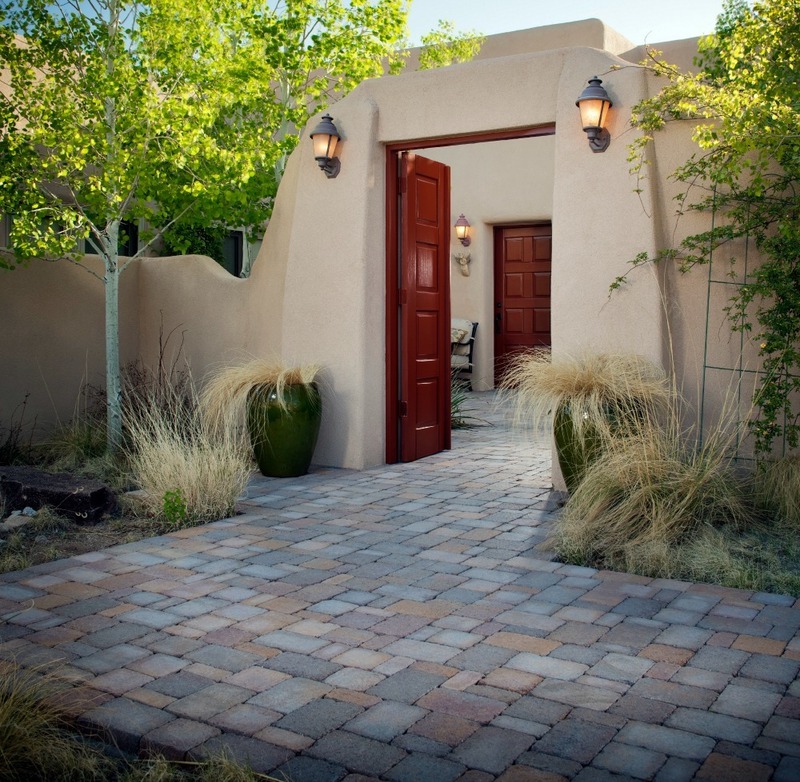 Let’s say you have an east compass reading which is between 67.5 and 112.5 (for compass readings and corresponding directions, see our guide to using feng shui in the yard). The element corresponding to east is wood, which represents the colors of brown and green and any shades thereof. But, if for some reason, shades of brown or green don’t work, then you can use colors of another element that nourishes wood which, in this case is actually water and earth. The colors of water are blue and black whereas the colors of earth are yellow and other earth tones like tan. Feng shui can get a little complicated, but there are plenty of experts and resources to help guide the way. It also involves keeping the door maintained well–no squeaky hinges or chipping paint. So, you can go with a color you like and forget the rest, use a color wheel, consider color psychology or opt for feng shui. How did you decide the color of your front door?